When shipping a motorcycle you can’t exactly put a stamp on it and wait for the mailman to come and take it. Dropping it off at freight companies such as FedEx and UPS can be very expensive and they may not even offer the proper service in order to ship your bike safely. If you are interested in shipping your bike, keep reading ahead for more details on how to ship your motorcycle. It is very common now a day to buy your motor vehicle far from your zip code; many times the best bargains are found cross country a couple hundred miles away. This is no problem, the better the price the happier we are for you, but how will you transport it? We are pretty sure you have seen a car hauler through the highway hauling 7 to 10 cars at once from one place to another, but what about bikes? Well, don’t panic, shipping bikes is as common as car transport and a lot less expensive. One of the main reasons why you have probably not seen as much bike haulers is because they are usually transported in enclosed carriers in order to protect them from outside factors. Although you may not see them as often, shipping your bike may seem reasonable when you are traveling long distances or have a lot of luggage to take with you. Bike transport is very common when it comes to moving motorcycles for vacationing purposes, internet purchases, motorcycle displays, and rallies; but where to start? How To Ship A Bike? Shop around: This is your precious belonging we are talking about; don’t be afraid to shop around until you find the company that offers what you need at the right price. You will find dozens of companies that ship motorcycles, make sure you check their ratings to see what other customer’s experiences have been like. Call them, give them details of what you expect and compare quotes. Open or closed? After you have decided which company suites you best, you must decide whether you want to transport your bike in an open or enclosed container. Enclosed containers will be more expensive, however it is hard to find a company that is willing to expose your motorcycle on an open container. Since bikes are smaller in size and have more delicate detailing than a car, they’re easier to damage and more exposed to any mishap during the trip. You may request an open carrier, however if you want to avoid any inconvenient, it is better if you go with an enclosed, you already spent the money to transport it, make sure you do it right. Paying the extra bucks now will save you from spending the big bucks later! Drain it or Pay it! A little detail most shipping companies will not tell you is the weight of the fuel issue. It is recommended you drain the fuel in your bike to at least a quarter tank. This will reduce the weight on your bike and ensure proper price tags on your transport. Many times companies will book you for a price and once the bike is loaded and they pass usual weight limits (due to the fuel), they will charge you extra fees in order to take your bike or either to drain some of the fuel out. Also, make sure all your personal belongings are removed from saddlebags before bike is picked up; any stolen or damaged items are not covered by the insurance. Was that there before? 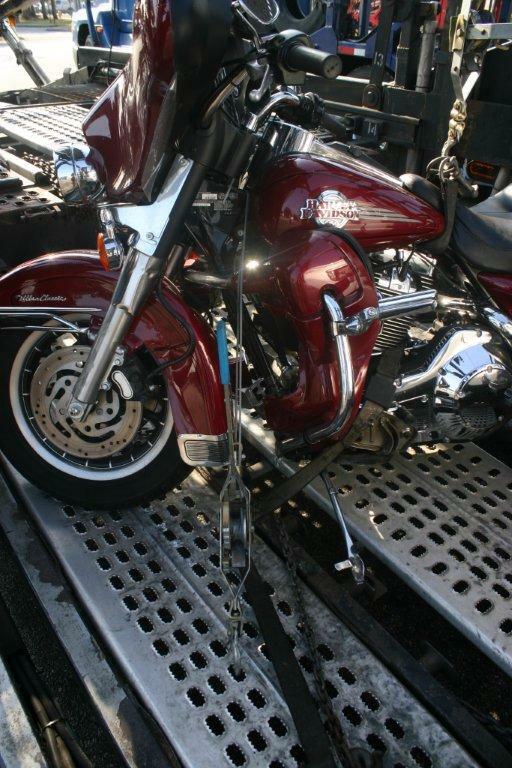 Make sure you check your motorcycle thoroughly before loading it to the carrier for scratches, bumps, or any other damages it may have if any. Make sure you are aware of the conditions of your bike before loading; this is for insurance purposes in case something happens to your bike along the way. Once your bike is delivered check it thoroughly again and make sure there are no new scratches or bumps. Real time expectations: When you book your transport service, agents will only give you estimate times. Key word: estimate. If we lived in a perfect world we could expect estimate times to become guarantees, unfortunately this is not the case. Most of the time deliveries occur on the estimated time or even before, however sometimes there can be delays due to bad weather conditions or traveling mishaps such as a flat tire. Don’t worry, delays can only take a couple days (1 – 3 usually), unless it is a big obstacle, therefore, be prepared in case this happens. Now that you are ready, call us at our toll free number: 1-800-516-3440 or You can fill our online free no obligation quote from your computer or any mobile device on the go.